This site was last updated on June 20th 2018. 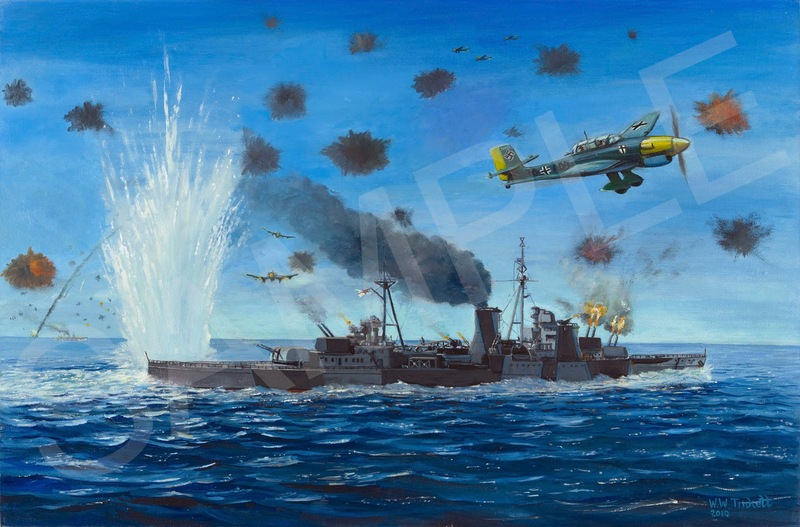 "HMS Ajax at the Battle for Crete"
This painting depicts just one of a whole host of such unbridled actions that occurred in the Mediterranean during this period of World War 2 where, with virtually no air cover, there was no protection for the Royal Navy from the ferocity of the combined air onslaught by the German Luftwaffe and Italian Regia Aeronautica, especially the Luftwaffe. This particular incident which occurred during the Crete Campaign in May 1941 is explained in detail in this website under the heading "The Battle". Clive Sharplin and his sister, Wendy White, commissioned the painting to celebrate the Centenary on June 4th 2011 of the birth of their father, Robert (Bob) John Sharplin, who served in the Royal Navy for almost 24 years before retiring in 1953 in the rank of Chief Petty Officer Mechanician First Class. Bob was serving in Ajax at the time of the action depicted in this painting. He died in 1979, one day before his 68th birthday, not leaving any personal records of this action other than having talked of it to his son many years before. He did confide some of his worst experiences to a great aunt but she subsequently proved reluctant to breach Bob's confidence even after his death. 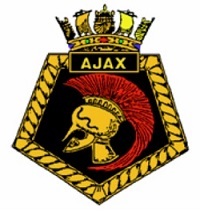 This website is a tribute to Bob Sharplin, his shipmates and all who served in both this Ajax and the Ajax which followed, a frigate, which was in commission from 1963 until 1985. This dedication is also extended to the Town of Ajax, Ontario, Canada, whose community named their town after this ship and its streets after the names of the crews of not only both ships but also those who served in the other Royal Naval ships which participated in the Battle of the River Plate, Achilles and Exeter. Bob’s name is commemorated there by "Sharplin Drive" (Note 1). The original intention of this site was purely to promote sales of prints of the painting while describing the detail of the action behind it and its historical place in World War 2. With the increasing amount of information uncovered during the research for the painting the early decision was made to widen the project so that the information gathered could be easily accessed by Bob’s family or possibly to assist others in their own branch of research, hence this website. The major question in deciding to create a painting depicting a part of Bob’s naval experience was what of? So many of the actions where he was present were already well represented in the art world by those such as the Atlantic campaign, the night action of the Battle of Matapan, the Malta convoys, the crippling attack on the Battleship HMS Valiant in Alexandria harbour and the D Day invasion at Normandy etc such that a study of his service record sought for other incidents. The action chosen, just one part of the Battle for Crete, had not to my knowledge been portrayed before in any medium. Indeed the published accounts of this action differ in quite a few aspects not least quite a few incorrectly recording that Ajax had actually been hit by the bombs targeted on her that morning. It was by no means a major action but one of a whole series of such intensive action packed incidents which made up the Battle for Crete when the Royal Navy, pathetically short of air-cover, when sent to perform an almost impossible task suffered the full onslaught of the German Luftwaffe aided by that of the Italian air force. An eyewitness to these actions in the Mediterranean wrote “Naval losses on both sides were enormous in a sea war which was fought with a ferocity equalling anything occurring in any other theatre of war” and I would add, in any other war at sea in any other time! (Note 2). One aspect that quickly became clear was that considerable erroneous information exists across published accounts and other sources, all without doubt well intended, probably basically emanating from earlier errors or assumptions perpetuated by being accepted as fact by those who followed and included in their own works. Even the official war diaries vary in the detail of various actions and the participants. My prime unimpeachable source was Ajax’s actual ship’s log as written that day and now in the care of the National Archive at Kew in England. Other aspects quickly attracted interest. If this was the seventh vessel of the Royal Navy to be named Ajax, what type of ships were her predecessors and what is known about them? From where did the ship’s name and its badge evolve? Was there a figurehead for any of the ships of the days of sail? From which Battles were the Battle Honours derived and by which Ajax were they won? What is known about the next Ajax? Even more curious was why did the community of a Canadian town in Ontario choose to name itself after this ship? Research never ceases, there is always another matter to check; eventually finding one solution often poses yet another question and so this site should be regarded as work in progress. My objective with this Website is to make it unquestionably authorative and thus a totally reliable source for other researchers as a visit to the Bibliography and Resource's Chapters will demonstrate, however, while I have endeavoured to authenticate and cross reference the content nothing can be perfect and this work does not pretend to be. If the reader can add, correct or offer any valuable comment, an appropriate image or fact I would be most pleased to accept it. Several matters have as yet no answers at all and are notated as my requiring any assistance that can be given (Note 3). And as for Bob Sharplin he seemed to have been born into a family with strong connections to the Royal Navy, what were those connections? In his almost 24 years of service as a sailor of the King, and for a short while the Queen, which ships did he serve in and when? What types of ships were they? What, if any, major events occurred while he was in those ships? How did his naval career develop? What were his badges of rank and professionalism? What did each typify? The main record sources were his service papers and documents provided by the Admiralty, again unimpeachable, some documents so flimsy and worn from following him around the globe for all his service life that they required quite delicate handling. Digitising those papers alone completes a long held family objective for them to be readily available family wide, but, perhaps they may be of use to others in their own research if only to provide an insight into one man’s career and of life in general for a sailor in the Royal Navy of this period. The result is this website, please enjoy. An introduction to HMS Ajax, the account of the Battle with eye witness descriptions and its place in modern maritime history. HMS Ajax in detail, her name, badge, motto, designer and builder together with an historical overview of all Royal Navy ships that have been named HMS Ajax over the last 250 years plus the new one now on order. The Painting of the Battle, the archival quality limited edition Giclée prints from the painting for sale and how to purchase. Why a town in Canada was named after this ship, a unique event. The Bob Sharplin Archive, the man and his service records with an illustrated history of all the ships and shore establishments he served in over 23½ years in the Royal Navy. Everything else! Bibliography, resources, links, Ajax collectables, authorities, attributes, copyright etc. Construction of this street in a new residential area was completed in 2013. It was dedicated to Bob in a Civic Naming Ceremony conducted by the Mayor of Ajax , Councillor Steve Parish, on June 16th 2014 held on the street during the Town's celebration of the 75th Anniversary of the Battle of the River Plate and at which Bob's son Clive (this author) and his wife personally attended. It was named Sharplin Drive and a duplicate of the street sign was presented to Clive on behalf of the Town Council. In return Clive later at a civic event in the Town Hall Clive presented Steve Parish with a print of the painting. It was later framed and now hangs in the entrance to the Mayors Office. Ibid - Bibliography, “A Midshipman’s War: A Young Man in the Mediterranean Naval War, 1941-1943” by Frank Wade. Some examples ibid – “Ships & Shore Establishments Served In” 16(a), 16(e), 31. © Clive Sharplin, Website design & construction by www.computersintheshire.com. Picture Window theme. Powered by Blogger.